Retiring from his book-selling trade in 1898 at the age of 45, Frederick Evans was free to pursue photography as a full-time profession. In 1900 he was invited to join The Linked Ring Brotherhood, a group of artistically progressive photographers. His work epitomised the ‘purist’ division of this group: those who defined the art of photography in the creation of a technically perfect negative so that the image would not need alteration during processing. Evans believed this to result from the photographer’s superior sense for composition and lighting, thus avoiding the technical manipulations of certain ‘impressionist’ photographers of the group to achieve artistic effect. Evans was recognised as an architectural photographer of exceptional quality. 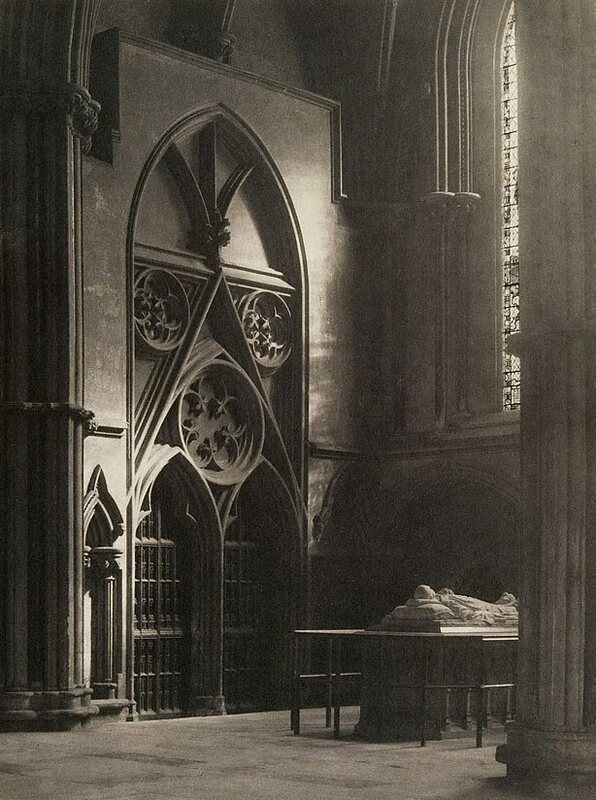 He redefined the traditional topographical photographs taken of Gothic cathedrals around England by re-imaging their spaces as seemingly infinite structures of shadow and light. ‘In sure and certain hope: York Minster’ is indicative of the painstaking process of careful observation undertaken by Evans to achieve the exact lighting and framing in order to allude to the spiritual dimensions of his subject. Evans saw in the architecture of the Gothic cathedral echoes of the vitalist patterning which he believed to underlie all natural structures. Thus ‘Lincoln Cathedral, from the castle’ 1898 (AGNSW collection) reveals the cathedral emerging as an almost organic mass of intricate detail in a magnificent glow of light from the blackened brick houses in the foreground. ‘In sure and certain hope: York Minster’ is also imbued with a sense of this complex cosmology. Through a masterful control of light, Evans transforms the subject towards the symbolic – into a vision of mystery and of the eternal. Signed u.verso card, pencil "Frederick Evans". Not dated. Denise Mimmocchi, Photography: Art Gallery of New South Wales Collection , 'International pictorialism', pg.53-69, Sydney, 2007, 56, 64 (illus. ).